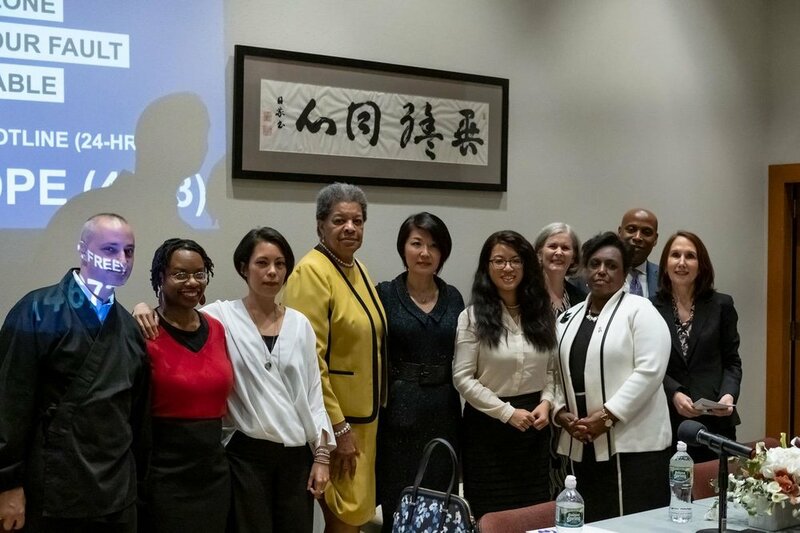 In observance of Domestic Violence Awareness Month, the Buddhist Action Coalition (BAC) partnered with the United Nations Association of the USA (UNA) in hosting a domestic violence panel discussion at the Rissho Kosei-kai Buddhist Center of New York. The evening opened with a moment of mindful meditation, fostering a communal atmosphere that carried through the night. At the evening's end, there was a sense of hope and optimism that comes with being better informed and, hence, better equipped in addressing domestic violence and serving the victims and survivors. The evening concluded with the well known chant from the Heart Sutra, as we held in our minds all people affected by domestic violence. Gate gate, paragate parasamgate, bodhi svaha. The BAC joined with many other Faith and Issue groups this Thursday in NY to March for Climate Jobs and Justice. It was a spirited and colorful march. It was a great day of community and solidarity for Buddhists at the March in NYC to keep immigrant families together. Thank you to those who endured the heat to participate in this inspiring day. San Francisco's SITS- Sangha in The Streets, also marched with the BAC banner in solidarity. The Buddhist Action Coalition held a Truthful Tuesday community dialogue at Union Theological Seminary on June 12, 2018 with the Poor People's Campaign & Picture the Homeless. The Campaign’s theme of the week was Everybody's Got a Right to Live: Education, Jobs, Income, Labor, Housing. A big thank you to activists with Picture the Homeles at the Truth Telling Project, the PPC, and Poet-Artist Amber Atiya for bringing insight and real lived experiences to the week’s theme. Buddhist Action Coalition participated in the March in Albany, NY with the Poor People's Campaign. The theme of that week’s Direct Action was: Everybody's got a right to live: Education, Jobs, Income, Labor, and Housing. It was so great seeing Buddhists from various traditions come out and engage in activism. Ven. Bhikkhu Bodhi spoke to the participating crowd about oppressive economic systems and how to support rights for the poor. March for Our Lives- Anti-Gun Violence rally. BAC joined in the March for our Lives with local NYC Sanghas. To name a few... New York Insight Meditation Center, Eco Sangha, Village Zendo, Brooklyn Zen Center, New York Zen Center for Contemplative Care, Zen Mountain Monastery. This was the first march to kick start BAC on it's path of activism. On February 3rd Union Theological Seminary hosted the first Buddhist Action coalition meeting! Over 250 engaged Buddhists came together to do thoughtful and visionary organizing work. More to come!